South Koreans watch a TV news program showing North Korean leader Kim Jong Un's New Year's speech, at the Seoul Railway Station in Seoul, South Korea, Jan. 1, 2018. North Korean leader Kim Jong Un says the United States must realize that the North's nuclear program is a reality. In his annual New Year's address Monday, Kim warned that he has a nuclear button on his desk. "The entire area of the U.S. mainland is within our nuclear strike range," Kim said. "The United States can never start a war against me and our country." The North Korean leader said his country "can cope with any kind of nuclear threats from the U.S. and has a strong nuclear deterrence that is able to prevent the U.S. from playing with fire." "The U.S.," he said, "must realize this is not blackmail, but reality." Kim vowed to not attack unless his country's peace was threatened. He also took a conciliatory tone with South Korea, suggesting that he was "open to dialogue." 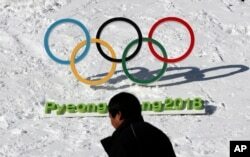 Kim said he would consider sending a team to the Winter Olympics, to be held in February in his southern neighbor. Kim's annual New Year's address is widely considered to be an indication of his direction and priorities for the upcoming year. Last year, Kim and U.S. President Donald Trump engaged in a series of escalating verbal exchanges, with Trump warning that North Korea would face "fire and fury" if it threatened the United States. Pyongyang responded by saying it was considering test firing an intercontinental ballistic missile into waters near the U.S. Pacific territory of Guam. Soon after, the North launched two long-range missiles over Japan and in September conducted its sixth nuclear test. The war of words continued in Trump's address to the United Nations in September, when the president referred to Kim as a "Rocket Man" on a suicide mission. 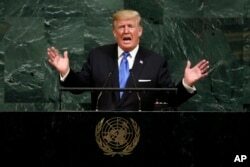 FILE - In this Sept. 19, 2017, file photo, U.S. President Donald Trump addresses the 72nd session of the United Nations General Assembly, at U.N. headquarters. Kim responded in a statement that described Trump as a "dotard," which means senile, and that described his behavior as "mentally deranged." In November, the North announced it had reached its goal of developing operational ICBM capability after it launched a long-range Hwasong-15 missile that could potentially reach the U.S. mainland. Kim also suggested in his New Year's speech that the North and the South should meet to discuss the possibility of the North sending athletes to the Pyeongchang Winter Olympics. South Korean presidential office spokesperson Park Soo-hyun said Monday the Blue House welcomes Kim's "willingness" to send North Korean athletes to the Olympics and "the suggestion that the two governments hold a meeting to discuss the issue." Sung Yoon Lee, an associate professor in Korean studies at Tufts, told VOA the current South Korean administration is "all for dialog and inter-Korean cooperation." Sung said South Korea welcomes what he called the North's "peace overture" that would place the South in "a better position to even try to persuade the United States to endorse South Korea's keen interest in re-opening the Kaesong Industrial Complex that was shut down almost two years ago." 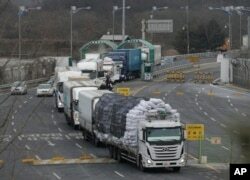 South Korea suspended all activities at the industrial zone it operated jointly with North Korea to punish the Kim Jung Un government for conducting nuclear and missile tests. FILE - South Korean vehicles returning from North Korea's joint Kaesong Industrial Complex pass the customs, immigration and quarantine office near the border village of Panmunjom, in Paju, South Korea, Feb. 11, 2016. The possibility of re-opening the complex, however, is fraught with complications, Sung said. "Kaesong has been a funnel, a cash cow for the North Korean regime, with South Korea sending upwards of $100 million, sometimes $120 million a year to the North Korean regime for workers' wages, which, of course, must have been diverted to North Korea's weapons development program," putting it in direct violation of the United Nations security resolution. When Kaesong closed, South Korean companies left behind over $600 million in equipment and raw materials. VOA's Victor Beattie in Washington D.C. contributed to this report.